A few years back we heard through the grape vine that friends who had moved away and we had kinda kept in touch with but not very regularly had a son getting married in Calgary. We thought maybe some of the kids or family would like to stay at our house as we had lots of room. Eventually it lead to a home swap - we'd go and stay at their house in Anchorage and they would have use of our house. Anchorage wasn't on our list of cities to visit but as "flaneurs" we are always open to new adventures. So we quickly did our research and made our plans. On of the first things we learned was that we couldn't be the "transit/pedestrian" tourist that we usually are as Anchorage doesn't have much of a transit system. We had been told that before e.g. Vegas and yet against all advice we managed to score a locals transit pass and we had a great time off the beaten path in Vegas - but that's another blog. But yes we did decided to rent a car in Anchorage and we are glad we did. Bonus - Avis Rent A Car didn't have the compact car we orders so we got a Mini Copper - Woo Hoo! From urban playground to outdoor adventure park, Anchorage offer up many unique adventures. One such experience is that it’s one of the best places in North America to experience the dancing, shimmering colours of the aurora borealis starting in late August through to late winter. Most hotels offer a “Northern Lights wake up call” so you don’t miss the spectacular free night show. Anchorage is a place that doesn’t sleep, at least in the summer - from late spring to early summer, plan for 20+ hours of daylight activities. For high adventure, visit Anchorage in the winter with its 20 hours of dusk/darkness per day, relishing in everything from dog sledding, skiing and beer festivals. Regardless of when you go, the best place to start your Anchorage adventure is the Anchorage Museum, which is actually six museums in one. To know Anchorage is to know the history and life of its people. The Smithsonian Arctic Studies Center, located in the elegant glistening new wing designed of the museum (designed by London’s David Chipperfield Architects) is an architectural gem offering a comprehensive collection of native artefacts and a wonderful listening space to hear captivating stories told by elders. Anchorage Museum is a must see and do. The building itself and the lawn is lovely, but once inside it is a Science Centre, a history museum and a contemporary art gallery. Every city should have one of these. There is also a wonderful cafe with great desserts. Alaska Railroad’s ‘Glacier Discovery Train Rail and Float Tour’ is a “must do.” The first leg has you riding the rails along the scenic fjord of the Tunagain Arm, past the Petrified Forest near Portage Glacier to the town of Whitter to pick up cruise ship passengers. All aboard and it’s off to the middle of nowhere where a waiting school bus shuttles you an d the group along a bumpy bush road to Spencer Glacier. After a quick picnic lunch, you pile into 8-man rafts (the guide paddles) to float amongst the dozens of icebergs that have calved off the glacier. Because the icebergs are grounded in a shallow lake, you can float so close you can watch them melt. Reluctantly, you leave the bergs to float down the Placer River where the tranquility and silence is absolutely eerie – not a bird, not an insect – nothing. Existential! Truly a truly memorable day trip! Check out www.alaskarailroad.com for this and other great rail adventures. Anchorage boasts over 650 kilometres of trails within its city limits. The Tony Knowles Coastal Trail is a very popular bike or hike for people of all ages and is easily accessible from downtown. There are many interesting places to stop along the trail including the Beach (actually mudflats, so you have to be very careful) and Earthquake Park to see with your own eyes how the earthquake shelved off a huge swath of land. Also along the trail are views of two living volcanoes - Mt. Redoubt and Mt. Spurr. Coastal Trail Rentals (www.coastaltrailrentals.com) downtown offers mountain, comfort and tandem bikes for $15 to $25/ four hours. 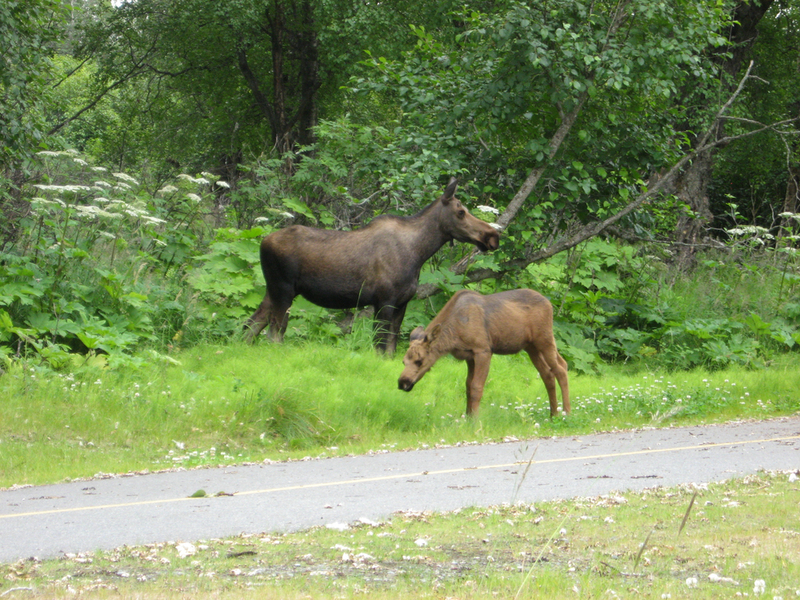 Kincaid Park, a 1400-acre forest in the middle of Anchorage is home to over 1,000 moose – an encounter with a moose is almost guaranteed. It is great place for a leisurely walk, run or cycle. Bring a Frisbee and try out the Frisbee golf course. Kincaid is also home to The Lekisch Loop. Lit for night skiing, it’s the hilliest, competition-certified 10K cross country skiing track in North America. For hikers, Flattop Mountain (3,510ft) on the edge of the city is a “must do.” After sharing the first few kilometres with dog walkers, you venture out on your own for an easy climb to the top of Flattop Mountain for an amazing view of the Anchorage Bowl, Mt. Denali and the Aleutian Islands. For the more adventurous, plan a day hike to Williwaw Lakes or Wolverine Peak. 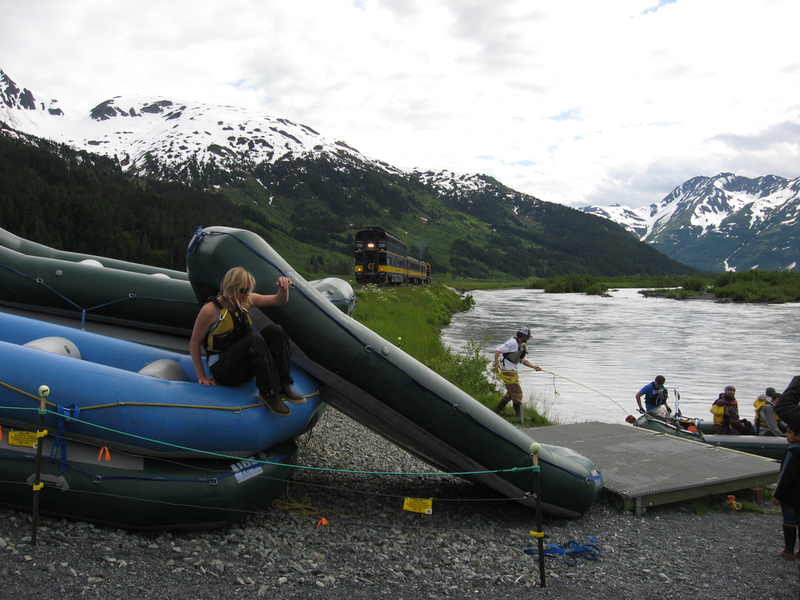 Girdwood (45 minutes by car or 2.4 hours by train) is a community worth visiting. Take the Alyeska Tram for a bird’s eye view of the seven surrounding glaciers, or walk up the mountain to the observation deck and take the tram down. Hike Winner Creek or Crow Creek Trail to lush temperate rainforest in the summer or enjoy the downhill skiing in the winter. Pamper yourself at the luxurious Hotel Alyeska (www.alyeskaresort.com). Rafting amongst the ice bergs was one of my most memorable experiences. It was so silent, not birds, no bugs, the dripping of the ice - it was a surreal moment! Exploring by train is a wonderful way to get off the beaten path in Alaska. The train stops and picks up rafters and hikers along the way. Too much fun! Anchorage offers everything from contemporary to roadhouse dining, from bohemian cafes to decadent bakeries. It is also home to 10 microbreweries. For foodies, Anchorage doesn’t take a back seat to Portland, Seattle or Vancouver. Alaska born Guy Conley, nominated for the 2010 James Beard Award for best chef in the Northwest, offers his twist on contemporary Pacific Rim cuisine at downtown’s Ginger. The grilled pork chop with raspberry chipotle glaze and pineapple fried rice is to die for and the ginger pear cheese cake with spiked caramel sauce will put a smile on your face. (www.gingeralaska.com). The Glacier Brewhouse is the iconic Anchorage restaurant and fun for all ages. The clam chowder is one of their signature dishes. Their Big Woody Barleywine won the gold medal at San Francisco’s 2010 Toronado Barleywine Festival (glacierbrewhouse.com). The best breakfast spot is Snow City Café (www.snowcitycafe.com). Popular with the backpack crowd it has a great vibe. Close to the several bike rental shops, it’s a good place for a hearty breakfast before hitting the Tony Knowles Coastal Trail. Downtown Anchorage has many great streetscapes with the best hanging baskets I have ever scene. The SNL District (Spenard Road and Northern Lights Boulevard), once the “red light district” of Anchorage, is now a funky bohemian area with its own farmers market (under the windmill), signature REI store (think MEC), as well as some quirky shops (e.g. Plato’s Closet) and great restaurants/cafes. Grab a brew at Kaladi Brothers Café, while browsing the Title Wave bookstore. What started as an espresso cart on 4th Avenue downtown, Kaladi is now Alaska’s signature coffee house and even has a one location in Seattle, home of you know who! If you are into blues, jazz or folk music, the Taproot offers a different genre every night (e.g. Sunday is “Down & Dirty Blues” and Wednesday is “Hodown Throwdown”). Check www.taprootalaska.com to see who’s on tap. The Native Health Centre is out of the downtown and not on most travellers radar, but certainly worth a visit as it is full of artwork and artifacts and the architecture is interesting also. 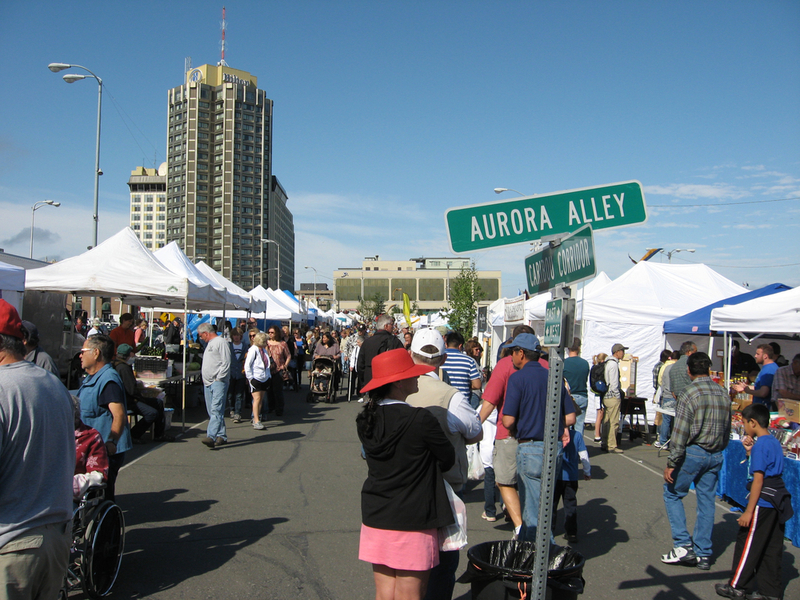 The Downtown Market & Festival, with its 300 vendors selling food, clothing and crafts takes over several downtown surface parking lots each weekend. Attracting 15,000 people a day, there is a definite festive buzz. It is a great way to spend a few hours mixing with locals. Mainstream shoppers will enjoy the Fifth Avenue Mall with JC Penny and Nordstrom as its anchors. Don’t miss the Alaskan Walking Shoe’s outlet store in the basement for great deals. Where to stay: Copper Whale Inn, in the heart of Downtown is one of the few buildings to survive the 1964 earthquake. Susitna Place Bed & Breakfast is perched on a bluff overlooking Cook Inlet yet only a short walk to downtown. Historic Ank Hotel is an elegantly restored 1916 hotel that is on the National Registry of Historic Places. The Anchorage Airport is like a contemporary art gallery with amazing works of art. This mask exhibition using found objects was outstanding. In Anchorage don't be surprised if you see a mother and daughter wandering the streets both in the residential neighborhoods and in the parks. This photo was taken from the train on the way to rafting. 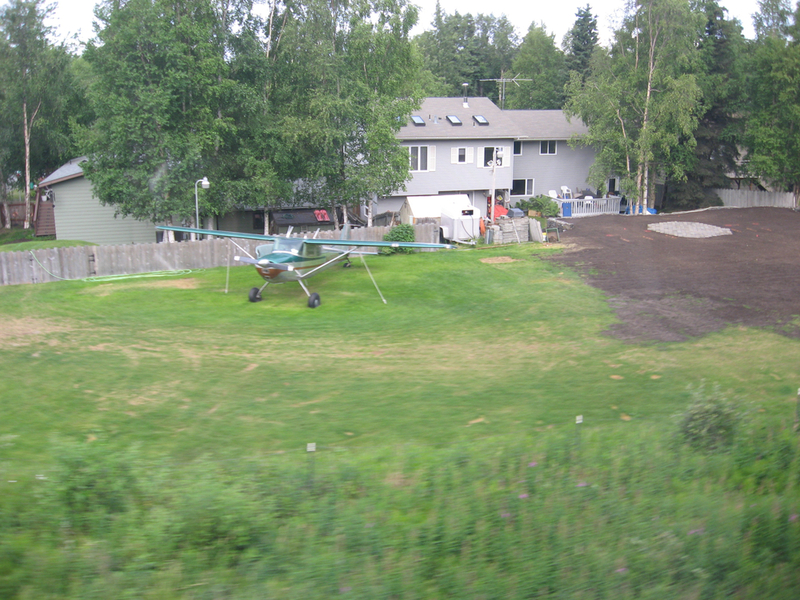 There is a community in the city limits that has a backyard airstrip...talk about fly-in fly-out! Travel Lesson Learned: Today, whenever we are going on holidays we tell our family and friends well in advance to see if they are interested in coming to Calgary and using our house for accommodations and vice versa. Last summer my Mom was heading to Iceland for an adventure so went and visited her for a few days and then used her house in downtown Hamilton, Ontario as a base to explore Southern Ontario. This is a good way to test if a "house sharing" experience might be for you. One of the many display areas at the Native Health Centre. This one is a collection of baskets from the various first nation communities in the area. Others have dolls and masks. Their is a sense of pride at the Centre for the artifacts as part of the people's history and it creates a wonderful sense of place. Centre is a free museum. I captured this image of someone walking past the Anchorage Museum. 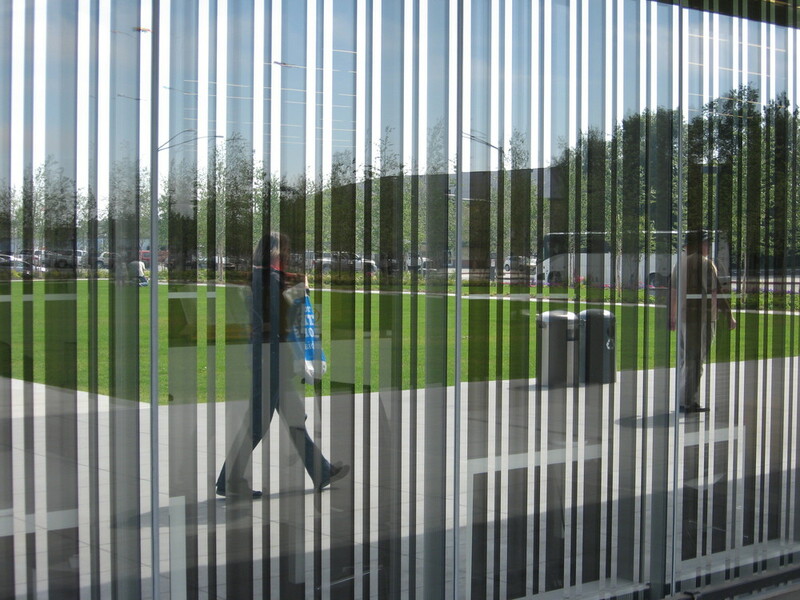 The facade of the museum is made of a reflective material that captures the people milling about the front lawn creating fun works of modern art. This is the front lawn or garden of the Anchorage Museum that creates an inviting entrance and is a clever link between the man-made museum and nature.